This weekend is all about mom. She works hard for the entire family and Mother’s Day is the one day every year dedicated to all she does. Pamper your mom with a delicious meal to remember. Waffles? Been there. Pancakes? Done that. Try mixing things up and elevating your Mother’s Day meal with delicious and versatile crepes! Breakfast in bed is a fantastic option to make her feel relaxed and loved, but lunch and dinner are also great for making her feel spoiled. 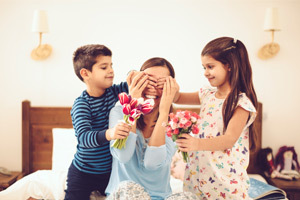 Breakfast in Bed – Sleeping late and eating in bed is a tough luxury to beat and breakfast in bed has become a Mother’s Day standby for good reason. Instead of the typical breakfast foods she eats every morning, pick up some fresh crepes from Crepe Delicious. The meal will be extra special and tasty, and you can customize the crepe to include mom’s favourites. Whether she loves bananas or has a sweet tooth, Mother’s Day means she can indulge in her dream crepe from the comfort of her bed. Family Lunch – Moms love spending time with their families, so why not celebrate with your mom over lunch? This month, Crepe Delicious has a special on our Salmon Deluxe crepe. It’s the perfect spring lunch meal for the entire family to enjoy around the table as you share stories, laugh, and thank mom for the big role she plays in your lives. Take Mom Shopping – Most moms love shopping. Take your mom to the mall followed by a meal at Crepe Delicious. Visit one of our mall locations as you let mom pick out the perfect present. We have options for everyone in the family, ranging from sweet to savoury. Stop by for brunch, lunch, dinner or even dessert! With a menu packed with fruits and veggies, mom will be happy to be treated and have everyone enjoy a healthy and tasty meal that she doesn’t have to cook. Host a Party – Big families know that there are more than one mom to celebrate! Grandmothers, aunts and other moms all deserve to be celebrated for their guidance, love and support. If you will be hosting a large event to celebrate the special women in your life, Crepe Delicious can provide event catering that is sure to impress your guests. Fresh, customized crepes will be made before their eyes. Let us worry about providing delicious food so you can focus on celebrating all the special moms. Make this year’s Mother’s Day celebration truly memorable by serving sweet and savoury crepes from Crepe Delicious. Check out our menu and find a location near you to try your favourite crepe.